Here’s a rhetorical question: Should you work hard to ensure your software code is readable, well-structured, uncluttered with useless or flat-out wrong information, and is well designed? Rhetorical question #2: Should you spend time polishing code when you modify or maintain it to ensure you’re improving the code you wrote earlier? “Uncle Bob” Martin’s Clean Code is a book full of sage advice on being able to deal with both those questions. The book’s broken into three separate sections: Good craftsmanship principles, case studies of refactoring code, and smells/heuristics in existing code. There’s also an appendix on dealing with concurrency. Martin starts out with a frank example of how poorly written and maintained code can torpedo an entire company. A product that Martin and many others used in the late ‘80s began to lag with its release cycles, and bugs weren’t being fixed in subsequent releases. The situation worsened, sales vanished, and the company eventually closed its doors. Martin recounts meeting one of the company’s employees years later – and finding out that an unmaintainable codebase was the cause of all the woes. Clean Code is intended to help you avoid such a mess. The initial section covers such fundamental principles as naming conventions, function/method design and layout, use of comments, and a passle of chapters on design principles. There’s a great wealth of things to get your mind rolling in this section, and you get a number of different voices/viewpoints as Martin brings in colleagues from ObjectMentor to write various chapters. The second section is made up of three refactoring walkthroughs. Martin shows the initial condition of each example (all real-world software), then goes into great detail of the small changes he makes to apply the principles from the first section. These three chapters are outstanding examples of putting the principles from the first section to work. Additionally, Martin’s writing style makes it seem that you’re sitting down with him for a pairing session as you read. Normally I hate these over-the-shoulder discussions because authors usually fail and end up with a sappy, overly chatty example. Martin’s succeeded at this before as well with his example of a pairing session in Agile Principles, Patterns, and Practices in C#, another book you should run out and buy. The final section is one chapter with a large number of smells and heuristics you can apply as you’re writing and refactoring your code. Each item is concise and to the point, some with terse but beautiful example code. The term software craftsmanship is generating a tremendous amount of discussion on blogs, articles, and podcasts. If you care at all about improving your skills and being a true craftsman, then you need to read this book. Also, if you don’t follow “Uncle Bob” Martin on Twitter, you should. You’ll get a passle of insightful bits on software craftsmanship, find useful tools like Uladoo, and get some passionate views on politics and life mixed in with all that. Malicious folks are out there. They want to hurt your software. You’d better do everything you can to keep those little b*#!&@rds away from your stuff. 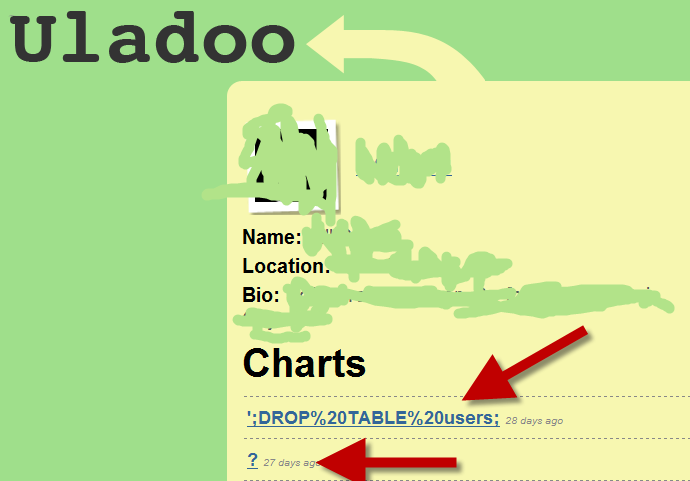 Look at this shot of a user at Udaloo, a nifty Twitter companion services that graphs stuff for you. This user was obviously trying to send garbage to Udaloo in the hopes of making it do Something Bad. If you’re not up on SQL injection attacks then you need to stop reading this post and go brush up on them. I mean it. Stop now, go hit the books. Maybe the guy is associated with Udaloo, maybe not. Don’t know, don’t care, because this is a great demonstration of the critical need to make sure you have your act together when dealing with user input. There are jackasses out there. Protect your stuff. Where all those $ thingies are input parameters. You’re finding that a suite you’re running loads into the Selenium TestRunner fine, but then just sits there and never executes. Solution: Double check that you’re loading a suite and not a test case. Test cases will load fine into the TestRunner, but won’t ever actually launch off. You get no error message, just a hung test. Not that I’ve done this myself, mind you. I just know someone who might have done this. Just sayin’. I’ve been having some issues where the first Selenium test suite in a series of suites was failing because of timeouts. Our Selenium test runs happen right after we completely repave our build box with new bits and a new database, so there’s some compile delays when Selenium first hits. Yes, ClickAndWait in a regular test case should be fine, but it wasn’t working. I’ve had a lot better luck using this approach and my irritation at chasing non-issue issues is slowly lowering. I had a power outage which caused a power loss to the external drive my VMWare virtual system’s running on – this is the wrong way to find out that the battery for my UPS is dead. As a result, VMWare died a nasty death and hung up. I had to terminate its process in Task Manager to get it to restart, always a semi-risky thing. When I tried opening up my VM again, I was greeted with the error message “This virtual machine appears to be in use” followed by some instructions to try and take ownership of the system. Those steps didn’t work. What did work was going in to the VM’s folder and deleting the various lock folders and files, those with an extension of “.lck”. Everything came up just fine after that. Now I need to go get a replacement battery for my UPS! I’m a firm believer that while a few great leaders (Eisenhower, Welch, Reagan) are born to the role, the vast majority of successful leaders have grown and/or been tutored into their roles. Leadership is indeed something that can be nurtured and learned, but only if the right environment is created to help current and future leaders develop their skills. So what should you take away from the series? If you’re currently running organizations, companies, or teams of any size, take away a commitment to better yourself as a leader. Take a long, hard, honest look at yourself and figure out what you’re doing right and what you’re doing wrong. Don’t forget to work on those things that are wrong! Also, take a look at how your organization’s supporting your growth as a leader. Reach out to your own leaders and ask for help with your leadership development. If you’re not in a leadership position yet, then take away a commitment to think about how you can work to develop your leadership skills. You’ll be called up at some point, so be ready to step in to a leadership gig when it arrives. How are your communication skills, particularly when you’re trying to convince others of your position? Are you treating others with respect? Are you asking for more responsibility, and executing on that? Regardless of where you’re at in your career, I’d challenge you to help raise awareness of the many problems our organizations face in developing future leaders. Encourage your organization to create mentoring programs that are more than just a free lunch once a month. Encourage your management and leadership to get serious about coming up with plans to groom future leaders, because more likely than not they’re dropping the ball in a bad way on that right now. This series has been very rewarding to me personally as I’ve written it, because it’s forced me to do a self-retrospective on a wide range of my own habits. I’ve come up with a number of things to work on, and that exercise is always a good one to go through. I’d also like to thank folks who’ve shared their thoughts on the series here on this blog, mail, or via Twitter. Your feedback and kind words have been greatly appreciated. A complete listing of all articles in this series can be found here. We’ve been working on using Selenium to write tests around our major functional slices in Community Server. Selenium enables you to write a test script that opens up an instance of Firefox, Chrome, or Internet Explorer and drives it around your website. You can navigate, check functionality, and test for text on the screen. It’s an amazing tool, and it is leaps and bounds ahead of the web testing functionality in Visual Studio, IMO. Selenium has a number of different parts to it: a server component to run the tests on a server, a remote control piece which lets you push tests through different browsers, and a grid piece to scale out execution for load testing/faster execution. The Selenium server test runners support a number of different languages, so you can write tests in C#, Java, Ruby, or a number of others. Tests are written those languages, then compiled into an assembly, and executed in one fell swoop by the server which consolidates all the output from the tests into one individual results file. We’re using program managers like myself to handle writing these tests, so we’re all over using Selenium IDE to record and maintain the tests. Selenium IDE records tests and stores them in an HTML file, so it’s easy for PMs to crack open and understand what’s going on. Support for running HTML test “suites” in Selenium is pretty spotty, unfortunately. The Selenium team’s focus has really been on supporting real languages instead of HTML. (No, HTML is not a programming language! You aren’t writing code if you’re writing HTML!) As a result, gaps in tools and a bug in the server code leave users with no way to automate a series of HTML test suites. You have to individually execute your test suites through Selenium IDE. While this is still tremendously useful, it’s painful if you want to run a large number of tests, or if you want to automate execution for dropping into a CI process like CruiseControl.NET. Moving to the pure language environment isn’t what we want to do at Telligent for our feature testing. We want to keep the HTML test suites because our PMs all understand HTML and it’s easy for us to write and maintain tests – we don’t have to divert devs from focusing on their work. There’s an option in Selenium IDE to convert the HTML to C#/Rub/Java/etc., but that’s a one-way tool and can’t be automated. Too brittle, too labor intensive. Again, everything points our environment to HTML. Your environment may and likely does differ. 0) Patch the Selenium server code to support HTML suites. 1) Build a script to execute your HTML test suites. 2) Build a script to read the suites’ output reports and consolidate the information for inclusion into your CC.NET report. First off, you’ll need Selenium up and running on your server. I’m not going in to that in this post. The Selenium site’s instructions on setup can get you going. You’ll also need a full version of the Java SDK on the server you’re running Selenium from, not just the JRE. Next, you’ll need HTML Tidy. We use that to clean up some HTML goo from the Selenium test reports so that we can treat those reports as XML in PowerShell. There’s a bug in Selenium RC that prevents the Selenium HTML test runner from correctly loading HTML test suite files. We need to fix that, so grab the Selenium RC source from the Subversion repository at http://svn.openqa.org/svn/selenium-rc. You’ll need to apply the patch discussed here and then use Maven to rebuild the jar file. Maven will drop the updated file into the folder selenium-rc\trunk\selenium-server\target. The jar you’ll use is ‘selenium-server-1.0-SNAPSHOT-standalone.jar’. You absolutely should rename that jarfile so it’s clear you’re running a patched version, not the stock one. Being a highly creative chap, I chose ‘selenium-server-1.0-SNAPSHOT-standalone-TelligentPatched.jar.’ Brings a tear to your eye, I’m sure. Launching an HTML test suite in Selenium is done by invoking Java to fire off the Selenium server (Dox on SeleniumHQ site). The snippet below shows some PowerShell parameters, i.e. “$browser”. The “-htmlSuite” param says you’re running the test in an HTML suite as opposed to a C# assembly, Java jar, etc. “$browser” lets you specify what browser to use. Chrome, Firefox, Opera, and Internet Explorer are among those currently supported. “http://localhost/csfunctionaltests/” is the root of the site your Selenium scripts will execute against. “$testSuitePath” is the test suite’s file location. “$testReportPath” is where the report for the specified test suite will get stored. # Get params, most likely passed from a .bat file. There are a number of ways to figure out what test suite files you need to run. We append “TestSuite” to all our suite filenames, i.e. “ForumCRUDP0TestSuite.html.” Using this convention, you could search a directory structure for all those test suites and iterate over them, launching the server jar as needed. Note that the test suite’s output report won’t get merged with other suite reports. You’ll need to have a separate name for each report and merge those after the run’s complete. Fear not, more details on that later. # Setup pairs of test suites with their report names. Note that these aren’t full paths, they’re partial paths under a common root. We’ll use an input parameter to control where that common root is, enabling us to easily support different environments on our build box and local dev machines. Now we can iterate through our list of test suites with a simple foreach. The loop sets up paths for the suite and reports, runs the suite, then does some processing on the output file to gather up statistics. We use HTML Tidy to clean up the report so we’re able to use PowerShell’s XML data type to easily pull important bits from the report. This loop can use some serious refactoring, but hey, we’re just at the “Green” stage of things right now. Note that I’ve done some line breaking for readability here. $buildScriptDir = join-path $testScriptsRootDir "BuildScripts"
OK, so we’ve looped through our array of test suites to run each individual suite and save its report, we’ve cleaned up those reports, and extracted out various statistics from them. First we’ll create our XML structure, then we’ll list our accumulated totals, following on with looping through test suites with failures, then finally closing out the XML structure and writing it to our output file. $xmlOut += "" + $accumulatedTestCount + "`n"
$xmlOut += "" + $accumulatedTestPasses+ "`n"
$xmlOut += "" + $accumulatedTestFails+ "`n"
$xmlOut += "" + $failure + "`n"
$finalReport = join-path $reportDir "selenium-results.xml"
We’re finally through the entire script! We run this script by invoking it from a batch file shown below. I’ve broken lines for readability, although the path to the PowerShell script will likely look like complete poo on my blog. Deal with it. The entire PowerShell script can be found on my site here. OK, that’s plenty to digest, and there’s lots of room for improvement in the process. As I said, we got past the Red stage and are at Green. Refactor comes as we figure out any hitches in this. Feedback is welcome, and I’d especially love to hear from any Selenium folks who’ve also solved this problem! With that in mind, here are a few smaller items about leadership fundamentals which you need to keep in mind as well. A leader needs to be close to and part of his team, but he needs to remember that he’s not IN the team. That sounds strange, so let me try to clear it up a bit. While you lead the team, you need to keep in mind that your teammates aren’t your peers. You’re responsible for leading them, you’re responsible for their success as individuals, but you’re also responsible for the team’s success and contribution to the larger organization. At some point you’ll have to make some difficult decisions, and sometimes an overly intimate relationship with your team can get in the way. Don’t get me wrong: build camaraderie with your team. Build strong bonds with your team. Build incredibly strong trust and communication with your team. But you’ve got to maintain a bit of distance between you and your team to ensure you’re able to have a clear head when it’s time to make tough calls. Part of this is also taking care to avoid blowing off steam around your team. Don’t vent your frustrations to your team, instead find a peer at your same level and form a Mutual Rant League. When you start venting to your team you’re injecting them with the same level of frustration you’ve got. Worse, actually, since it’s a one-to-many relationship and whatever you feel frustrated about will get vastly magnified and distorted when you vent to your team. Finally, they’re seeing that you’re not living up to the Calm in a Storm tenet I wrote about earlier. Unfair? Maybe. Deal with it. You’re a leader. Act like one. Hopefully you’ve got a team built up of top-notch performers. They’re elites who work hard, work well, and work to continually improve themselves. The 10X productivity factor of your elites isn’t a myth, it’s a reality, and it’s a reality that brings your organization incredible success. At the same time, keep the entrance door open to that group and encourage people from other teams to aspire to get into your team. Don’t you dare drop the bar for entrance to your elite team, but make it clear to others that they can join the Kool Kidz if they have the right mindset and put in the level of work required to lift themselves over that bar. Furthermore, open up that door even wider: actively encourage members from other teams to join your brown bag lunch presentations. Set up developer exchanges where outsiders can join your group and get fired up about how neat it is to learn new things and succeed at them. Your elites are the drivers of success in your organization. Recognize them as such. Do I really have to write about this one? Yes, unfortunately, I do. Criticism to one of your team members should never be given in front of others. Do it in private where there’s no sense of confrontation and egos can stay a bit less inflated. Furthermore, you’re bettering your odds of success for ensuring the criticism is taken as guidance for the receiver to improve on something. Criticism in public is nothing more than a slapdown, and it’s always going to leave hard feelings. Even worse, your team’s going to take a significant morale hit as they see you grinding someone down in front of them. They’ll lose the confidence you’ve worked to build up in them for fear of being castigated in public for errors, right or wrong. Conversely, offer up your praises in public. Recognize the person in front of their peers. You’re lifting up the recipient, and you’re building good morale with the peers, too. Successful Team? It's the Team's Success, Not Yours. Sports teams are great for this: the coaches generally make sure the players get the limelight. Apple’s nearly the complete opposite: Steve Jobs seems to take credit for every accomplishment and gets his name on many of the patents awarded to Apple when I doubt he’s the driving force behind many of them. Ensure the spotlight’s on those who actually do the work. You lead, but your team wins the victories. System.IO.Path.Combine rocks for safely combining directory paths, but it’s got a silly inflexibility built in which means you’ve got to clean up paths you first pass in to it. Path.Combine(“C:\Foo\”, “\bar”) results in “\bar” because you’ve given Combine “\bar” which is a root-level folder. Unfortunately, there’s no flexible way in the API to deal with this, so you’ve got to do some pre-processing first. Invoke this via “CombinePaths <rootDir> <subDir>” with a space, not a comma, between the two. It’s not rocket science, and I’m sure some PowerShell guru will tell me all this can be done some other way in three characters – which is fine, so show me! Let’s take as a given that your team is comprised of average or better folks. If not, then you’ve got other issues you need to address that are outside the scope of this series. With that ground rule in mind, if you’ve hired good people, then pay attention to what they’re saying. If someone on your team brings up a point, they’re raising it for a reason, and furthermore, since you’ve invested in getting solid folks, they’re likely bringing up for a reason that will benefit the team. If one of your team members is talking to you, take the time to listen to what they’re trying to tell you. If you’re not understanding what they’re saying, then you need to work harder – as a leader, it’s your fault if your team can’t get something across to you. Read that again, because it’s important. Communication problems between you and your team are your fault. There are two aspects of this, both on your shoulders: First, you haven’t invested enough time with your team to learn their communication style, or to educate them on how to better communicate. Secondly, you’re not working hard enough to hear what they’re trying to tell you. As an example, a friend of mine repeatedly ran into roadblocks when trying to pitch crucial upgrades and changes to his company’s infrastructure. The changes were utterly necessary to remove roadblocks hindering a large group of really talented folks who were constantly delivering value to the organization. My friend didn’t have the best communication talents and sometimes delivered his requests in a blunt, unclear fashion, but what he was trying to say was critical to the success of the organization. The organization’s head, instead of making the effort to clear up the communication issues, repeatedly fell back to a default answer of “No.” The boss’s failures to expend the effort to work through the communication blockages resulted in all the requests getting turned down. This ended up causing more blockages and slowdowns with his group – something you really don’t want when you’ve spent time and money to hire top-notch talent. Furthermore, my friend got extremely frustrated and took a pretty good morale hit since he couldn’t get any traction in trying to solve problems. Your team needs to believe that you’re an advocate of theirs. Your team needs to believe that if they raise issues to you, you’ll invest the time to understand their problems, and that includes spending time to break through communication barriers with them. Your team shouldn’t expect that they’ll get their every wish, but this falls back on your shoulders too. If you’ve worked to clearly understand the team’s requests, then you’ll be able to clearly communicate back to them the reasons why you may not be able to move forward with their request. Your team will have seen that you’ve take the time to hear them out and have put some conscious thought into your decision. You have good people. Invest the time to make sure you understand what they’re trying to tell you. Updated: Complete listing of articles in this series here. John Kellar posted up a great video he made at CodeMash on his Edge of Dev series for Telerik TV. There’s a bunch of video of an interview John did with me, but most of the video’s great stuff John took around the conference itself. John did a tremendous job capturing all the cool stuff that goes on at CodeMash.